Automatic Head Slotting Machines are improved in design for high production and take minimum set-up time. The slots by our Automatic Head Slotting Machine (Japanese Type) are deep, clean and curved at the bottom. Our Automatic Head Slotting Machines have high speed performance and are free from trouble. Our machines are simple in adjustment and are fully automatic. Number of branded bearings has been used while manufacturing Automatic Head Slotting Machine which ensures to deliver high speed production and provides great saving of labor and lubrication cost. The machine design is clear and every person can understand it easily. Automatic Head Slotting Machine can be availed at affordable price from us. 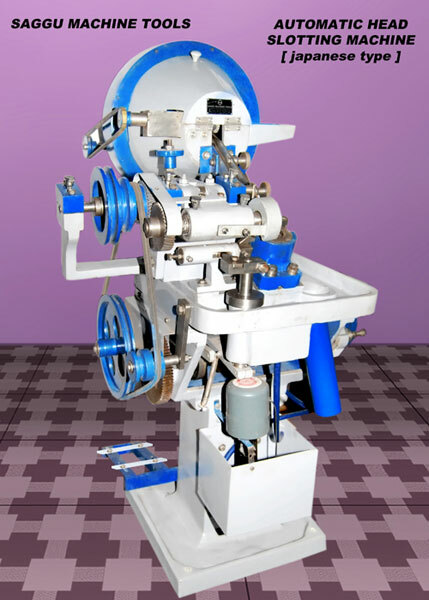 We are a well-reckoned Automatic Head Slotting Machine Manufacturer, Exporter and Supplier in Punjab (India).